The day started off with a keynote speech from Steve Etches who spent over 35 years collecting fossils from the Jurassic Kimmeridge Clay deposits of southwest England. His collection of over 2,300 fossils found an exciting new home in 2016; the Etches Collection immersive museum in Kimmeridge, Dorset. It was interesting to find out about the difficulties associated with starting a museum from scratch, but despite the initial challenges, the museum looks incredible and is filled with a diverse array of scientifically important specimens. Jurassic fossils collected by Charles Moore from Strawberry Bank. 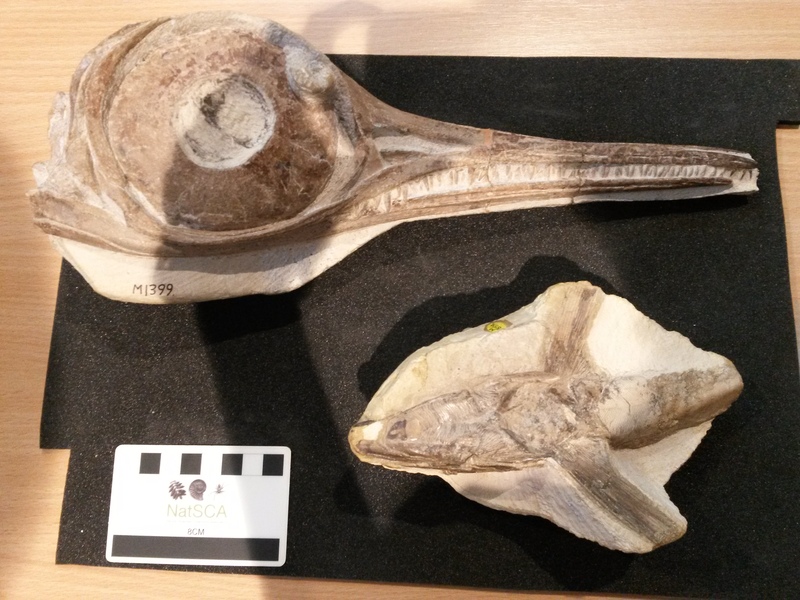 Top: Juvenile ichthyosaur skull (Hauffiopteryx typicus). Bottom: Partial ray-finned fish fossil (Pachycormus sp.). © Nadine Gabriel. As a mineral enthusiast, I really enjoyed the talks about the mineral collectors of the area. Sir Francis Basset (1757-1835) collected many minerals from Cornwall since his estate included several mines. Basset’s collection contained classic Cornish minerals such as cassiterite, native copper, siderite and olivenite; some of these were donated to the BRLSI in 1826. Another Cornish mineral collector, Richard Talling (1820-1883), collected minerals when mining activity in Cornwall was high. Between the 1850s and 1860s, Talling sold some of his minerals to the British Museum for £20-100 per lot, which is a fortune because the annual wage at the time was just £40-90 per year. Throughout the day, there were chances to view posters about fossil collectors, mineral collectors, scientific photography, hydrogeology and even the geology of gravestones! Other talks covered a wide range of geological time periods. Around 435 million years ago, Beacon Hill in Somerset was a volcanic arc similar to the Lesser Antilles in the Caribbean. During the Late Triassic, spores of Naiadita sp. (a type of liverwort) floated across the Bristol region. Then we learnt about the ice age caves of Pleistocene Plymouth where humans, hyenas, cave lions, wolves and woolly rhinos roamed. The relationships between geology and architecture were discussed with presentations about the geological origins of the limestones used by the Romans as building stones in Bath (if you look closely at the stones, you’ll find fossils and sedimentary structures), and how the construction of Brunel’s Great Western Main Line led to the discovery of exceptional fossils in 1841. For cartography fans, there were three talks about geological maps. In 1864, William Sanders (1799-1875) published a 720 square mile geological map of Bristol and surrounding areas which would have cost £300 in today’s money. 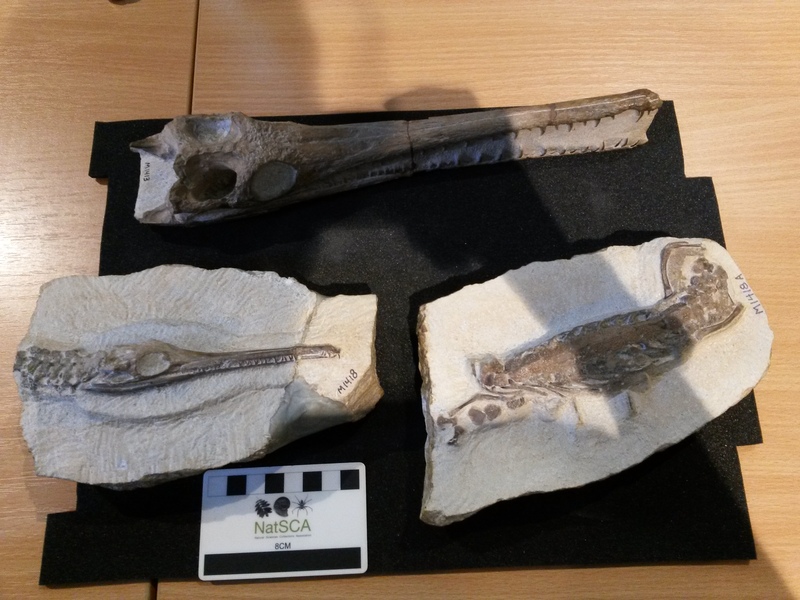 Jurassic fossils of a crocodile-like reptile (Pelagosaurus moorei). Collected by Charles Moore from Strawberry Bank. © Nadine Gabriel. So what were the take-home points for the day? 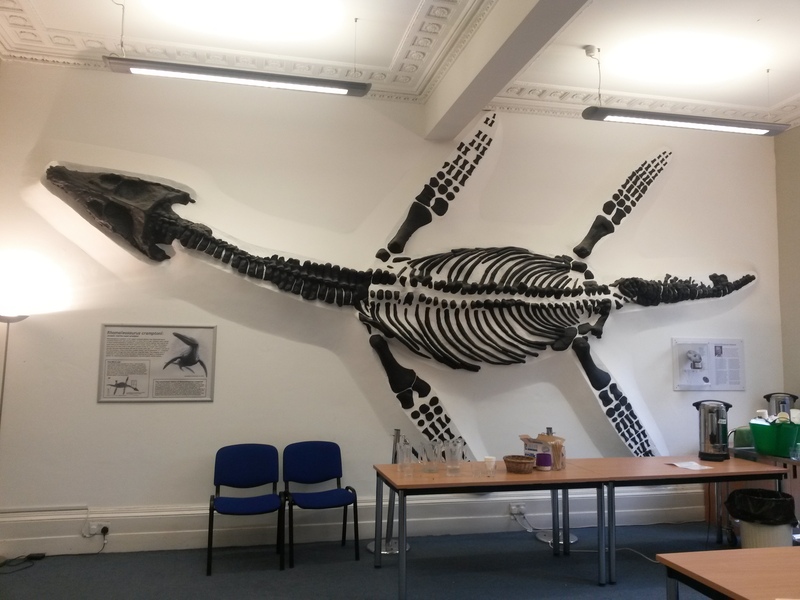 Poster Room: A cast of the famous, and much travelled, fossil of a Jurassic pliosaur (Rhomaleosaurus cramptoni) first unearthed in 1848 by workers in an alum quarry at Kettleness in Yorkshire. The cast dominates in the Lonsdale room, where posters and literature were displayed and coffee and tea served. © Nadine Gabriel.